Carteret RV is your premier North Carolina RV Dealer on the Crystal Coast! We feature Park Models from Forest River, Woodland Park Homes and Canterbury, Wildwood Travel Trailers by Forest River, Outback Ultra Lite Travel Trailers by Keystone and Viking RVs. Stop by the dealership or call us today at 252-393-2306! Check out our Lastest Arrivals! We have new Wildwood Travel Trailers, Outback, Woodland Park Homes, Canterbury Park Models and much more at the dealership. New inventory is arriving daily, so please come see us!! You Can't Beat our Sale Prices! All 2019 models are on sale... Featuring our lowest prices ever on select models!! Park Models, Travel Trailer, X-Lites, Destination Trailers and more. We feature Wildwood Models by Forest River, including Travel Trailers, X-Lites, DLX and Heritage Glen! Wildwood packs in quality and convenience with only the best components as well as fine design and engineering techniques. Ask about special order discounts! Woodland Park Homes have proven to be one of the most sought after park model home brands around. These high-quality, custom-built park models designed exclusively for destination camping offer the finest in park model living. Woodland Park builds a variety of recreational park models customized to meet your needs. Apply Now for a Personal Loan from OneMain Financial Get started making your RV dream a reality today! Carteret RV is proud to offer Canterbury Park Models for high-end destination living! Check out our Quailridge and Summit Park Models by Forest River! From seasonal living to destination camping, Forest River has park models to meet your needs. Every square inch is engineered to enrich leisure time with home-like comforts and time saving conveniences. 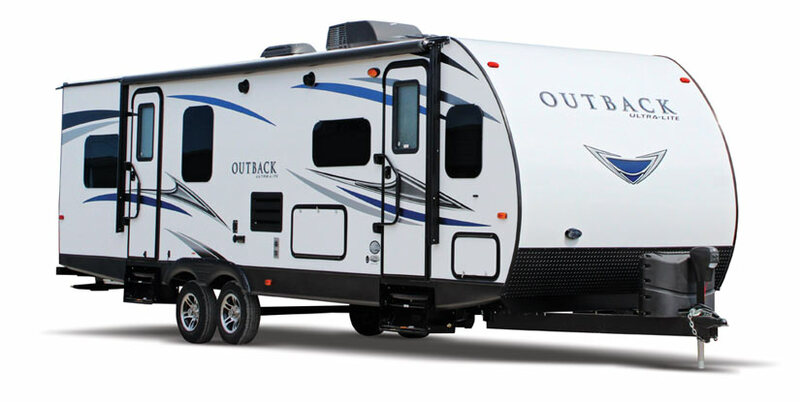 You can special order your Outback Super Lite Travel Trailer or choose form our existing inventory at the dealership! We want to be the destination for all of your RV purchase and service needs, while making the road smooth and enjoyable in the process! 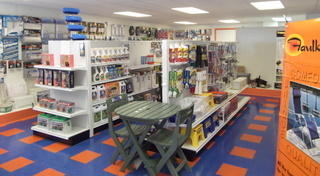 We have an awesome Parts store with everything you need to keep your RV in tip top shape plus great accessories to enjoy your outdoor living in style! Carteret RV has a full service department, providing services and repairs on your lot or at the dealership. We offer consignment sales and trade-in opportunities at Carteret RV Dealership. Sell your RV without the hassle! We have a great selection of park models, travel trailers, destination/park trailers, fifth wheels, lightweight RVs, parts and accessories! We are on the Crystal Coast of North Carolina near RV Parks in Cape Carteret, Emerald Isle, Atlantic Beach, Swansboro, Newport, Harker’s Island, Topsail Island and surrounding beach towns. We also offer consignment and trade-in opportunities. If you have been trying to sell your travel trailer, park model, fifth-wheel, motor home or any type of recreational vehicle, we can help! Visit our sales office, call or visit us to get started! Carteret RV, your Coastal North Carolina RV Dealership, provides new and used RV inventory. Our parts store has everything you need to stock up your RV and keep it in top shape. We have a full RV service and repair department providing service at the dealership and on-lot at our local RV Parks. Our goal is to be the trusted destination for all of your RV purchase and service needs while ensuring a smooth and enjoyable road in the process!